Federal Hocking’s varsity basketball teams are off to a good start in 2018. Both teams came into the New Year looking to add more wins to the win column. The Lady Lancers played three games in five days hosting Athens, traveling to Miller, and returning home to play Nelsonville. The boys played two games, hosting Wahama and Nelsonville. The Lady Lancers finished this week with a mark of 2-1 with wins over the Lady Bulldogs of Athens, Hocking opponent, 5-5 Miller, and a loss to Nelsonville-York’s Lady Buckeyes. On Tuesday, January 2nd, the Lady Lancers hosted the Athens Lady Bulldogs at McInturf Gymnasium and came away with a decisive 57-42 victory. This contest was highlighted by the Lady Lancers defense from early on, holding the Lady Bulldogs to just 9 points at the end of the 1st Quarter, and 19 points in the first half. Not only was their defense on point in the first half, but they also had great scoring opportunities and their offense was flowing well. Freshman Paige Tolson showed off some skill early on in the contest and finished the first half with 10 points. Hannah Dunfee added 8 points and the Lancers took a 32-19 lead. The story of this contest was Federal Hocking’s defense. The Lady Lancers dominated the court on defense all night long. The girls from Federal Hocking blocked 11 shots in the win, and came away with a number of steals that they turned into points. In this contest Hannah Dunfee led the Lady Lancers in scoring with 18 points, and Paige Tolson put up 12 points. Thursday, January 4th, the Lady Lancers traveled to Miller to take on the Lady Falcons. The Lady Lancers would play a close game with the Miller and come away with the win late in the game, 44-41. Both squads played big on defense, not really allowing either team to find a rhythm early on in the contest on the offensive end of the court. Fed Hock’s defense has been very good all season long, and it was no different in this one. Throughout the game through, Fed Hock’s Hannah Dunfee seemed to be firing on all cylinders. She made plays on defense, and lead her team all night. She also lead all Fed Hock scorers with 18 points on the night, including a clutch three-pointer at the end of the contest when tied with Miller at 41 to give the Lady Lancers the win 44-41. In their last game of the week, the Lady Lancers would not come out victorious as they had in their first two matchups of 2018. When Nelsonville-York’s Lady Buckeyes came to town on Saturday, January 6th, they took down the Lady Lancers 47-31. The Lady Buckeyes brought two prolific scorers with them in Jesse Addis and Mary Kate McCulloch with them and they picked up right where they had left off all season. Despite playing good defense in the contest, Nelsonville-York’s offense proved to be too much for the Lady Lancers. The Lady Buckeyes were able to capitalize on Fed Hock’s mistakes early on in the contest. A shining light in the matchup though was Hannah Dunfee, who has brought consistent play to the court for the Lady Lancers all season. She led all Federal Hocking scorers with 17 of Federal Hocking’s 31 points against Nelsonville. NY’s Jesse Addis had 15 points, to go along with 5 steals. Nelsonville-York won the contest 47-31. The girls are now 8-4 on the season and sit in third place in the TVC- Hocking, behind only Waterford and Eastern, their only two TVC losses. The boys from Federal Hocking finished 1-1 this week, taking down Hocking opponent Wahama at home on the 5th, but falling to Nelsonville on the 6th. On Friday, January 5th, the Lancers played host to the Wahama White Falcons at McInturf Gymnasium. In their previous game, the Lancers snapped their 28 game losing streak behind Nate Massie’s career high 31 points, and they were looking for another win against Wahama. Early on in the contest the Lancer defense was playing well, and forcing Wahama to commit turnover after turnover. The boys from Fed Hock were able to convert these turnovers into points, and lead 25-12 at the half. Branden Gould led Fed Hock scorers in the first hald with 10 points. In the past the Lancers have had their share of troubles with turnovers, but this was not the case against the White Falcons. In the first half the Lancers only had two turnovers, while Wahama had 13. Under Coach Kevin Dunigan, the Lancers have begun to correct their offensive woes of the past. After a late rally by the White Falcons, Federal Hocking was able to begin to pull away. After the Fed Hock lead was brought to just 45-39, the Lancers were able to fend off the White Falcons and come away with a 48-41 victory. Branden Gould and Josh Rice would each score 13 for the Lancers in the contest, which shows that the Lancers are not just dependent on the talented Freshaman Massie, but that they are committed to working as a team to get the job done. For the first time in a while, the Lancers had a winning streak, two games in a row, with the wins coming at South Gallia just two days after Christmas, and in their first contest of 2018 at home against Wahama. Federal Hocking’s win streak would come to end though the next day, Saturday, January 6th, when they were bested by the Buckeyes of Nelsonville-York 53-38. The Lancers were not able to keep up with NY’s quick offensive attack, and couldn’t quite matchup to the Buckeyes’ size. The Lancers returned to some of their older offensive troubles, and they gave up turnovers that the Buckeyes were able to turn into quick buckets. One thing that stands out though is that the Lancers were in the game the entire time, but the Buckeyes were just overpowering to them. The Lancers continue to show flashes of great potential on the court this season, and I expect to see it in the coming games, they already have a better record this year than they did in all of the 2016-2017 season. 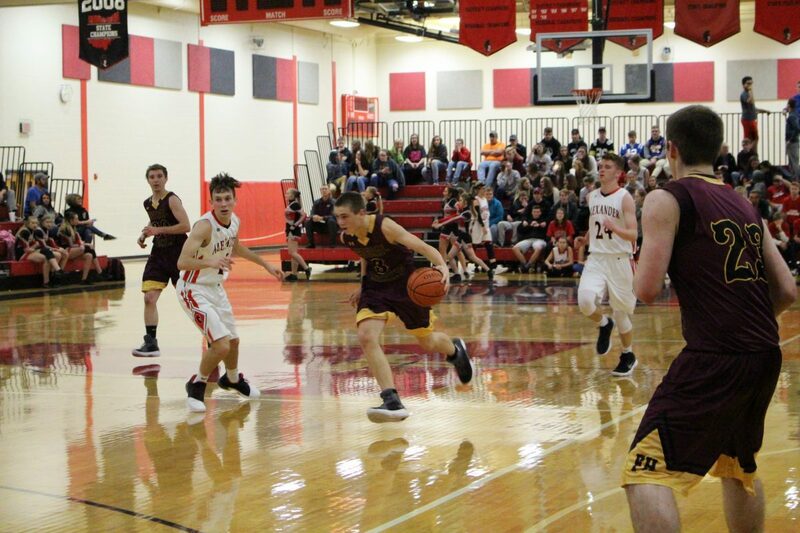 Two wins may not look like much, but the boys from Federal Hocking are starting to discover their sweet spot under first year Head Coach Kevin Dunigan, and at 2-6, with two league wins, they sit at 6th in the TVC-Hocking. The boys from Federal Hocking will be back in action this week as they host the TVC-Hocking 2nd Place Trimble Tomcats at McInturf Gymnasium on Tuesday, January 9th. They then hit the road for two games and travel to Amanda-Clear Creek on Wednesday, January 10th, and then they travel to Athens on Friday, January 12th for matchup with the Bulldogs. The girls team has some time off and their next game comes on January 14th at West Muskingum.